We are seeing double this summer! The team at TGHG is working hard to get Harry’s 2 open in Coconut Grove and looking forward to popping James Beard Award-winning Philadelphia via Israel (and regularly back and forth!) chef Mike Solomonov there on Monday, November 9 to celebrate his new cookbook, ZAHAV: A World of Israeli Cooking. Make a new house a home, right? In the meantime, we are excited to have another genuine event to share with you close to home in the Design District with our fearless leader doing the cooking. 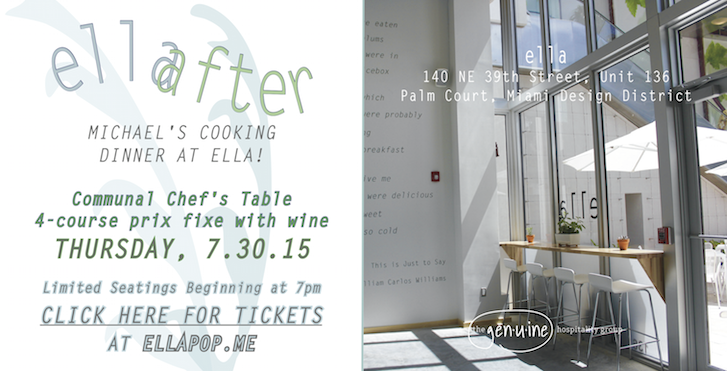 Michael Schwartz is making dinner at ella on Thursday, July 30! Chef’s light and airy café, now open in Palm Court in Miami’s Design District, will remain open late on Thursday, July 30 for ella after, a prix fixe dinner of 4 set courses with wine pairings for $75, excluding tax and gratuity. The event will be set up inside with communal seating and is available exclusively through advance tickets now live HERE (and via ellapop.me/ellaafter) in the following 2-hour time slots: 7pm, 7:15pm, 7:30, 9pm, 9:15pm, 9:30pm. For this event there are no substitutions and all sales are final as seating is very limited. Please be on-time — after 15 minutes seats will be forfeited. The day of the event the café’ will be open for breakfast and lunch, but will close slightly early to prepare for ella after. ella is nestled in Palm Court, a beautiful sun-drenched plaza in Miami’s Design District. The café’s address is 140 NE 39th Street, unit 136, Miami, FL 33137 and is open Monday to Saturday from 9am – 7pm serving breakfast, lunch and early evening bites, with beverages including juice and soda, Panther Coffee, beer and wine. ella offers takeout and accepts all major credit cards. ella is now offering half off spritzes, sangria, beer and wine from 5-7 p.m.! In addition to street parking, the Design District offers valet from $5 located at the entrance to Palm Court on 39th Street in between NE 1st and NE 2nd Ave and the Palm Court Parking Garage is open from 9 am to 9pm Monday-Saturday and 11am – 7pm on Sunday, $3 for the first 4 hours, $6 for 4-6 hours, and $25 for 6+ hours, with the entrance located on NE 38th St.
Connect with ella on social media @ellapopmiami or reach our team at 786.534.8177 and ellapopmiami@gmail.com.